I've been in love with the WayForward's eShop titles ever since Mighty Flip Champs! dropped in 2009. 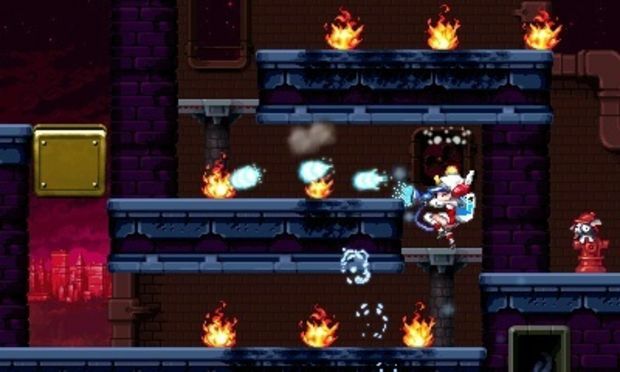 It was a beautiful, challenging, vibrant game that was followed up by Mighty Milky Way and Mighty Switch Force!, with the latter seeing the most success -- enough to warrant an HD Wii U port and a full sequel. The only problem is, WayForward tends to excel when it's constantly thinking up new worlds and characters. I think somewhere in the process of developing a sequel, they missed a bit of the magic. Once again heroine Patrica Wagon will be tasked with finding the loveable Holligan Sisters, but instead of putting them behind bars, she's saving them from certain death -- specifically, dying in a fire, since the entire area has been set ablaze. This time around Patrica has hung up her police badge and taken up the career of a firefighter, which of course means she'll function a bit differently. Instead of wielding a laser pistol, she'll predictably be blasting water out of a hose, which allows you to manipulate select muddy blocks, destroy enemies, and of course, put out nasty fires. Block switching is back, allowing players to change two sets of blocks from the foreground to the background with the press of a button. Really, that's about it. 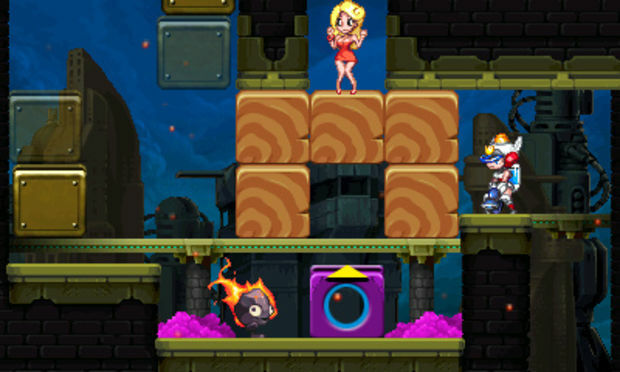 If you can imagine the first game with a fire hose it's essentially the same game re-skinned, with a few minor new concepts to grasp, like occasionally pumping water through puzzle-pipes that gets very tedious for a few levels, and leading flaming enemies to wood-blocks, which feels exactly like leading bombs to blocks in the first game. In fact, it's so similar to the original that I even felt like I was playing the exact same game a few times, with very familiar level layouts and designs. One level (Incident-06) even feels like a shot-for-shot rehash of a stage from the original. It wouldn't be a major issue if it weren't for the fact that the game only had 16 levels, but by the time you reach some of the new concepts, the game is practically over. Switch Force! 2 attempts to mix things up with the hose by providing you water-based puzzles and new block types, but ultimately these just feel like an extension of the first game's laser pistol puzzles. In other words, instead of going the full-mile and embracing the water aspect (for example, with a hypothetical new swimming mechanic), it just feels like a re-skin rather than a new game. Of course, the classic Switch Force-style gameplay still holds up, as the controls are still just as tight, and the level design (barring a few boring stages) is still top notch. You'll still find yourself switching like crazy as you traverse some well-designed tricky jumps, and scratch your head during some of the more formidable "lock block" puzzles. You'll have the opportunity to tackle all of the game's 16 stages after completion with a powered-up gun (again), and go for each level's par time for fun, and that's about it. There's also a hidden baby (that you get to kick to safety in hilarious fashion) in each level should you want more. If you haven't experienced the Switch Force series yet, you're probably better off buying the original or the Wii U update for now. Mighty Switch Force! 2 isn't a bad game by any means, it's just more of the same sans an upgrade of the formula, and the level design is actually a bit weaker than the original (but still good). Maybe if a third entry is ever announced (featuring Doctor Patricia, perhaps? 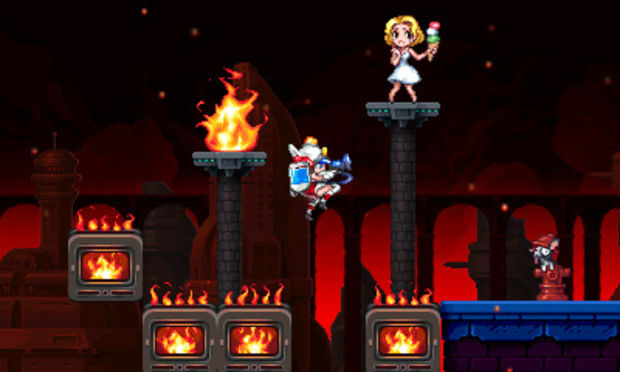 ), WayForward can really push the envelope.